Nomadic has a reputation for innovation; pushing the boundaries of what's possible, pioneering new construction methods, new design techniques and new ways to save. The versatility of our Instand® custom portable displays allows you to have a display that works in a multiple sizes - ranging from 10x10 to 40x40. 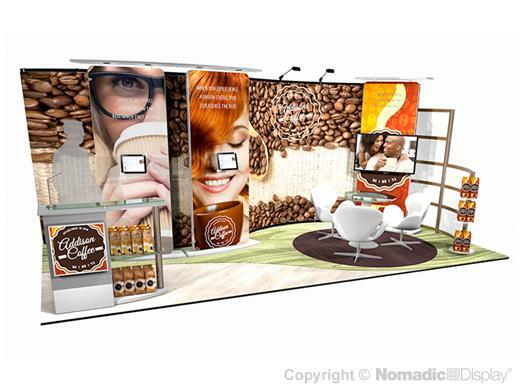 Whatever you need for your shows, Nomadic display components can be mixed and matched to provide you a quality display that turns heads. Coupled with our History of Lasting Performance, 24-Hour LifeLine, Worldwide Support, Best-in-Class Warranties and Scalable Systems provide the easiest solutions for your clients. This custom portabe display features product shelving, opening seating area, AV for looping presentations, and a reception counter for greeting visitors.